"The news is that we are broadening the community, the family. We are working for a new European dream today. 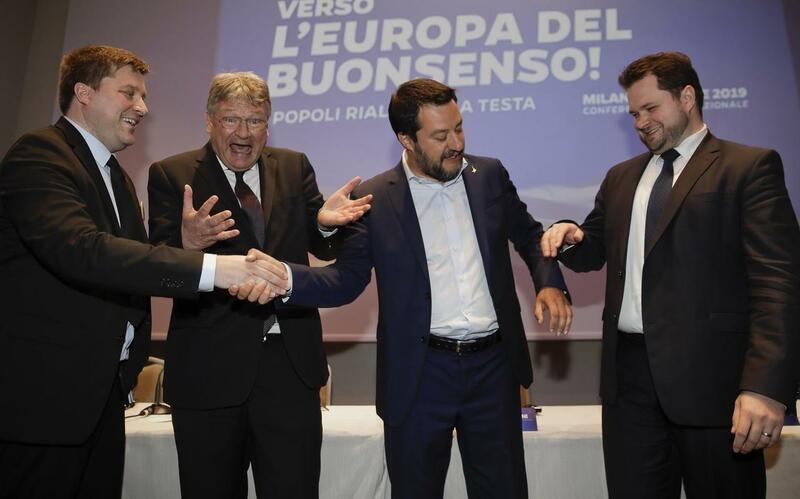 For many Europeans, the EU (European Union) is a nightmare," Italian Deputy Prime Minister Matteo Salvini told reporters following a meeting of Europe's far-right party leaders met in Milan on Monday. Salvini is spearheading the alliance, called "Towards a Europe of Common Sense," which he says he hopes will "win and change Europe." The alliance hopes to form a majority bloc following the May 23-26 elections - "the most numerous, important, determined and forward-looking group," according to Salvini. "We are not aiming to lose or just participate. Our goal is to win and change the rules of Europe." The group's top priorities are a halt to all clandestine migration, restoring political sovereignty to EU nations, protecting "European culture," and stronger European borders - while the #1 threat to Europe is Islamic extremism. "As interior minister for 10 months, the No. 1 risk in Italy and Europe is Islamic extremism, Islamic fanaticism, Islamic terrorism," said Salvini. "There are extreme-right and extreme-left minorities in Italy and in Europe, (but) they fortunately are controlled and of limited numbers." Salvini rejected the notion that the groups are filled with political extremists bent on totalitarian rule. "Today at this table there are no nostalgic extremists," he said, adding: "The only nostalgics are in power in Brussels. Today, we look ahead with a clear memory of what happened in the past, but the tired debate of right, left, fascist, communist, is not what makes us passionate." The alliance, which is holding a rally on May 18 in Milan's central Piazza Duomo, says their invitation is open to all like-minded parties who wish to join the faction. If they win a majority in the EU elections, the group would cancel for good the process of inviting Turkey to become a member of the European Union - a process which has been stalled for years.